In my many years of practicing veterinary medicine here in the Vail Valley, I have seen innumerable coughing dogs, during every season of the year from many different causes, and some more life threatening than others. As a pet owner, when should you get concerned when your pet is exhibiting a cough? What signs would you look for and what could this cough represent? It's normal for your pets to sniff and get their noses where perhaps they can be exposed to bacteria, viruses or even foreign material such as grass. But why is your pet coughing now? There are innumerable reasons for a cough in dogs, but these are the most common. Kennel cough is a very common reason for the active pet who visits the dog park frequently or is often groomed or boarded in doggie day care where chances of exposure increases. Owners often confuse kennel cough with something caught in a pet's throat, as the pet will try to cough up something with no success. Because this is highly contagious, your pet should be seen by your veterinarian and depending on the severity, may be treated with cough suppressants and potentially antibiotics for any secondary infections. Lung problems or pneumonia can also cause a cough. Pets, just like people, can get respiratory disease, which is primarily infection based. If your pet has an infectious lung disease, the cough will often be "productive," meaning you will see discharge coming out both the nose and the mouth. Allergic respiratory disease can also be present in a pet. Pets can have allergies resulting in an asthma-like condition, especially during times of the high allergy season, or after exposure to wildfires, dust and changes in environment. Allergic respiratory disease can be treated with both oral and inhalant medications and managed over time. The cough is often a dry, hacking cough. Heart disease in pets can also be represented as a cough because as the heart begins to fail and fluid builds up in the lungs, making it uncomfortable for your pet to breathe. This is common in your older pets, but can be seen in younger pets with congenital heart disease. Often your pet will have a fluid sound when breathing, and the tongue color can become blue as your pet is less oxygenated. Fungal infections can result in coughing as they can be picked up in the dirt or in the air in various parts of the country, and present themselves later when the owner has returned home. Heartworm disease is often forgotten when we evaluate pets for a cough, but certainly has become more prevalent in our state in recent years in all ages of pets. Parasites, in addition to heartworm, can travel to the lungs and cause coughing and lead to life-threatening lung disease. If your pet is coughing, think of the many reasons listed that could be the cause, but certainly see your veterinarian as quickly as possible. Chest X-rays, in addition to baseline blood work will likely be performed to ascertain the cause and develop a treatment plan. This article was written by Sheila Fitzpatrick DVM, owner of the Mountain Animal Hospital Center & Mobile Veterinarian. She can be reached at 970-328-7085. Q: My cat is allergic to everything: fleas, food, pollen, etc. She has scratched and bitten all the fur off her belly and chews at her legs. How can we manage her condition and help her stay comfortable? A: That’s a triple-whammy. We often see flea-bite allergies in cats, and environmental allergies aren’t unusual either. Food allergies are less common, but they definitely occur. Signs for all three can be similar: scratching, biting, rubbing and grooming excessively. Other signs include sneezing, watery eyes and ear infections. All of those things add up to one seriously uncomfortable cat. Treatment is individualized to each cat because they all have different signs. Beyond corticosteroids, your veterinarian may prescribe antihistamines, cyclosporine and allergy shots. All of these may play a role in helping to reduce your cat’s intense itching. Used with antihistamines, essential fatty acid supplements may contribute to itch relief, too, according to some veterinary dermatologists. In dogs, applying EFAs topically has been found to help improve what’s known as barrier function, the skin’s ability to repel pathogens that can aggravate atopic dermatitis. We don’t know if that works in cats, but it’s something to ask your veterinarian about. • If your dog is fearful of loud noises, such as thunder, fireworks, vacuum cleaners, gunshots or traffic sounds, you may be giving him a medication called Sileo (dexmedetomidine), which is FDA-approved to treat noise aversion. The oromucosal gel is administered to the dog’s gums with a special multidose syringe. The FDA warns that dogs can receive too much of the drug if the syringe isn’t set up properly. To prevent accidental overdoses, be sure you understand how to determine the appropriate dose based on your dog’s weight, lock the syringe in place and deliver the drug so the dog doesn’t swallow it. No deaths have been reported, but possible effects of an overdose include sedation, lethargy, sleepiness, slow heart rate, shallow or slow breathing, difficulty breathing, impaired balance, low blood pressure, muscle tremors and loss of consciousness. • Love the look of a longhaired cat with a pointed coat? The Birman may be the breed for you. The sweet social butterflies love following their humans around the house and settling into a lap whenever possible. Their silky coats are easy to groom and don’t have an undercoat to form mats and tangles, though they still need daily combing to remove loose hair and prevent hairballs. • A new system being tested at the port in Mombasa, Kenya, may allow specially trained dogs to search large shipping containers for contraband ivory, rhino horn and other wildlife products using only a small air sample. Called Remote Air Sampling for Canine Olfaction, the system will draw air from specific containers and pass it through filters that are then presented to the dogs, trained to sit if they scent anything illicit. The technique could allow the dogs to check many more containers daily, reducing trade of illegal wildlife items. Seasonal allergies can certainly make people feel miserable this time of year, but our four-legged friends may be suffering from allergies as well. When Sandy Laurel became a dog mom to her now 11-year-old Maltese, Buster, she thought pet ownership would be pretty simple. But a few years ago, Buster started scratching himself to the point that Laurel says he would get skin infections. "It started with all of this scratching, itching and then he would get like little sore spots... it was more seasonal but it just continued," Laurel said, and as Buster got older, the allergies got worse. Laurel brought him in to see Dr. Jae Chang, a veterinarian who treats cats and dogs with seasonal allergies. People with allergies to pollen, dust, animals, or molds have bodies that think these allergens are dangerous to the body and have built up immune defenses to attack these allergens and keep them away from vital organs of the body as if they were a dangerous virus. This is called Allergic Rhinitis. When immune system cells inside your nose come into contact with these allergens they send off chemical messages to all your cells that they are under attack. These messages cause the lining in your nose to swell and to start producing mucus. This mucus causes runny noses. The swelling and mucus can cut off your eye drainage passage which causes the itchy watery eyes. The swelling can also cut off the passage to your ears which causes stuffy head and clogged ears. There are nerves in the nasal cavity that attach directly to the brain. The mucus and swelling can irritate these nerves, and when they are irritated you start to sneeze. Finally, the mucus draining into your throat can cause the itchy throat feeling. There are 3 strategies to treat allergies. Avoid the allergens so your body doesn’t react. Disable the immune system so the swelling and chemical reactions don’t happen. Teach your immune system that allergens are not dangerous viruses or bacteria. Limit your outdoor activities when pollen counts are high.​ This will lessen the amount of pollen allergen you inhale and reduce your symptoms.Keep windows closed during pollen season and use central air conditioning with a HEPA filter​ attachment.​ This applies to your home and to any vehicle (car, bus, train, etc. ).Start taking allergy medicine before pollen season begins.​ Most allergy medicines work best when taken this way. This allows the medicine to prevent your body from releasing histamine and other chemicals that cause your symptoms.Bathe and shampoo your hair daily before going to bed. ​This will remove pollen from your hair and skin and keep it off your bedding.Wash bedding in hot, soapy water once a week.Wear sunglasses and a hat. ​This will help keep pollen out of your eyes and off yourhair.Limit close contact with pets that spend a lot of time outdoors.Change and wash clothes worn during outdoor activities.Dry your clothes in a clothes dryer, not on an outdoor line. Certain over-the-counter and prescription medicines may help reduce pollen allergy symptoms by disabling the immune system reactions. Antihistamines​ come in pill, liquid or nasal spray form. They can relieve sneezing and itching in the nose and eyes. They also reduce a runny nose and, to a lesser extent, nasal stuffiness. Decongestants​ are available as pills, liquids, nasal sprays or drops. They help shrink the lining of the nasal passages and relieve nasal stuffiness. Use decongestant nose drops and sprays only on the short-term.Nasal corticosteroids​ are a type of nasal spray. They reduce inflammation in the nose and block allergic reactions. They are the most effective medicine type for allergic rhinitis because they can reduce all symptoms, including nasal congestion. Nasal corticosteroids have few side effects.Leukotriene receptor antagonists​ block the action of important chemical messengers (other than histamine) that are involved in allergic reactions.Cromolyn sodium​ is a nasal spray that blocks the release of chemicals that cause allergy symptoms, including histamine and leukotrienes. This medicine has few side effects, but you must take it four times a day. Many people with pollen allergy do not get complete relief from medications. This means they may be candidates for immunotherapy. Immunotherapy is a long-term treatment that can help prevent or reduce the severity of allergic reactions. It can change the course of allergic disease by modifying the body’s immune response to allergens.Allergy Shots - Subcutaneous Immunotherapy (SCIT) ​has been around for more than 100 years and can provide long-lasting and permanent symptom relief. SCIT is a series of shots that have progressively larger amounts of allergen. An injection of the allergen goes into the fat under the skin. Over time, allergic symptoms generally improve. Many patients experience complete relief within one to three years of starting SCIT. Many people experience benefits for at least several years after the shots stop.Sublingual Immunotherapy ​involves placing a tablet containing the allergen under the tongue for 1 to 2 minutes and then swallowing it. In 2014, the FDA approved three types of under-the-tongue tablets to treat grass and ragweed allergies. More are in development. You take SLIT tablets daily before and during grass or ragweed season. This treatment offers people with these allergies a potential alternative to allergy shots. Discuss your allergy symptoms and your allergy treatment plan with your healthcare provider. Learn more online at www.allergybutler.com or by calling (801) 652-7666. For the longest time, our dog Grant had this thing about the dew claws on his front legs. At certain times during the year, he’d start nibbling away at them almost constantly. We applied creams, sprays and bitter-yuck remedies… all to no avail. We carefully checked around the claws, under the claws and on the legs themselves. A trip to the vet revealed no specific health issues, except for some superficial redness due to Grant’s manic chewing. Then, finally, we put it together: Grant’s dew claw dabbling coincided with the onset of his seasonal allergies. In humans, familiar allergy symptoms often include sneezing, itchy eyes and stuffy noses. But for years, well-known holistic veterinarians like Dr. Karen Becker and Dr. Richard Pitcairn have reminded pet parents that canine allergies may manifest themselves through skin and/or ear issues. These topical, symptomatic reactions are typically termed allergic dermatitis — i.e., inflammation or generalized irritation of the skin. Remember that “allergy season” can occur at different times of the year, depending on the dog. Our hound mix Maizy, for example, gets incredibly itchy right around Indian summer; but she’s perfectly fine by late fall. Grant seems especially reactive during the spring. And other pups may experience no seasonal changes whatsoever — yet exhibit sensitivity to something in their home environment or to an ingredient in their food. Most pet parents are aware that mainstream veterinary science tends to treat recurrent or worsening allergies with antihistamines, anti-inflammatories and even powerful corticosteroids. While this approach can certainly help to break the cycle of itchiness or irritation, it may not fully address the underlying cause. 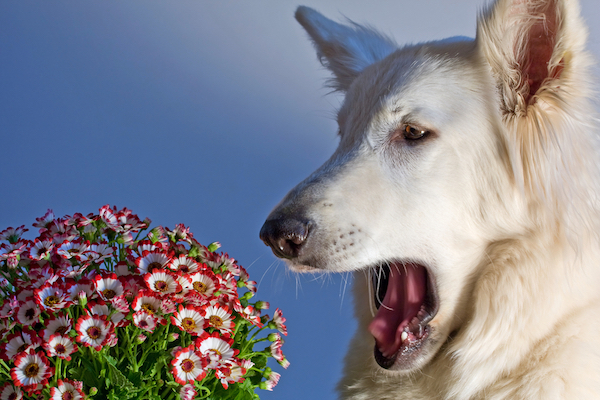 Dog with flowers by Shutterstock. In his Complete Guide to Natural Health for Dogs and Cats, Dr. Pitcairn explains that seasonal allergies are an immune system response. They manifest when your dog develops a sensitivity to something that’s been encountered, consumed or absorbed from the surrounding environment. So one of the most straightforward ways to reduce allergic response is by minimizing exposure to substances that tend to overstimulate the immune system. Many drugs fall into this category, and yearly vaccines are also an immune system stimulant. Talk with your vet about less-frequent vaccination options that still offer protection. Several common vaccines, such as the rabies vaccine, are available in a three-year formulation. You can also ask your vet about titers, which measure canine immunity to certain diseases. This information can help determine whether vaccination is actually necessary. In her book Canine Nutrigenomics, Dr. W. Jean Dodds notes that canines don’t have a specific, minimum dietary requirement for carbohydrates. This doesn’t mean you need to eliminate carbohydrates entirely. But it’s worth noting that especially high-carb diets tend to overload your pup’s system, thereby aggravating the inflammatory response associated with allergies. Read food labels, and minimize or eliminate white potatoes and grains. Carbohydrates like these can fuel both inflammation and yeast — the latter of which may cause secondary itchiness and irritation on top of an existing allergy.Add 1/4 to 1/2 teaspoon of coconut oil to your dog’s daily diet. The lauric acid can help inhibit yeast production.Add 1 daily teaspoonful of fish oil, which is rich in Omega-3 fatty acids. These can help decrease systemic inflammation. 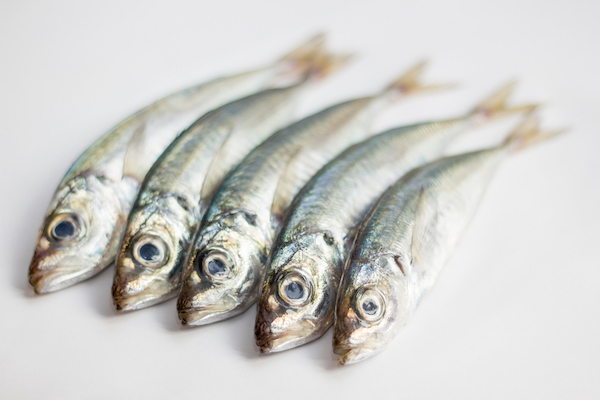 Dr. Pitcairn’s book notes that some of the best sources include salmon, sardine, krill and anchovy oils. Simply feeding a half-sardine daily makes for a fun, healthy snack (just ask Maizy). You can also try plant-based sources such as flax, hemp or borage oils. Many dogs don’t efficiently convert these actual seeds to their most useful structural component, docosahexaenoic acid (DHA). The oil version can sometimes help ease assimilation. Traditional Chinese Medicine (TCM) is built around dietary principles that characterize food energies as “cold,” “neutral” or “hot.” So for example, during intervals of more intense allergic inflammation, TCM would advise you to avoid foods and proteins on the “hotter” end of the dietary spectrum. These include beef, chicken and lamb. A better choice would be “cooling” proteins, such as rabbit, bison and egg whites. Find a licensed TCM practitioner to obtain additional insights. The National Certification Commission of Acupuncture and Oriental Medicine can help. Ever stop to think that every time your head out for a walk or romp, your dog’s fur and paws collect and carry literally millions of inflammation-causing allergens? Set up a simple foot soak basin near your front door. Quickly dunking each paw can dramatically reduce the number of allergens your dog tracks into your home. Use fresh, plain water with a teaspoon of Epsom salt; or buy a bottle of iodine and add 1 teaspoon per 5 cups of water. Short on time? Dampen a clean rag with this solution and gently wipe each paw.Remove allergens and relive itching by bathing your dog every other week. Choose a gentle, organic baby shampoo product and add 2 to 3 drops of inflammation-reducing coconut oil to the bottle. You can also try an enzyme-based shampoo like Zymox. In addition, use a damp washcloth (or hypo-allergenic pet wipe) to wipe down fur at least once per day.Saturate a gauze pad with plain saline solution and wipe around your dog’s eyes once daily. I’ve found that this can greatly relieve itchy eyes during peak allergy intervals. 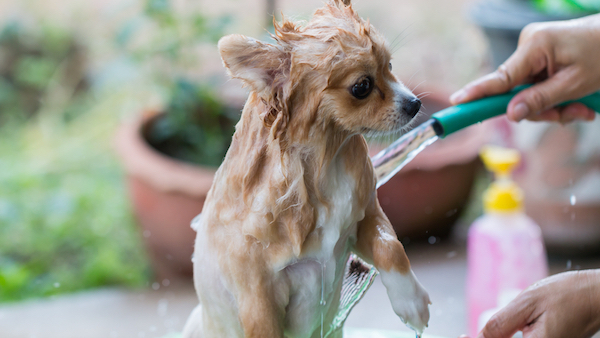 Pomeranian getting a bath by Shutterstock. Switch from chemical-based household cleaners to non-toxic cleaning products. And did you know that constant vacuuming may actually kick up allergens? Instead, consider investing in an air purifier or UV germicidal light that attaches to your air conditioner. We also like to slip inexpensive pillowcases over dogs beds and simply wash them once per week. "It's all about our Pets"